Douglas Alexander Bannatyne graduated LLB from the University in 1903. He was born on 25 March 1890, in Glasgow to Kate Bannatyne (nee Broadley) and Mark Bannatyne, solicitor and partner of the firm Bannatyne, Kirkwood & Company. In 1900, Bannatyne matriculated at the University of Glasgow to study Law. He lived with his family at 15 Windsor Terrace West in Glasgow for most of his degree and did very well, receiving distinction in all his subjects. He received five prizes during his time as Glasgow, in Constitutional Law & History, Civil Law, Conveyancing, Forensic Medicine and, in Scots Law, he received the Robert Ross Prize for his eminence in class examinations. After graduating on 21 April, 1903, he became a law apprentice and continued living in Glasgow in his family home. Bannatyne joined the Inns of Court Officers Training Corps shortly after the outbreak of the First World War and received a commission for the Royal Scots in 1915. 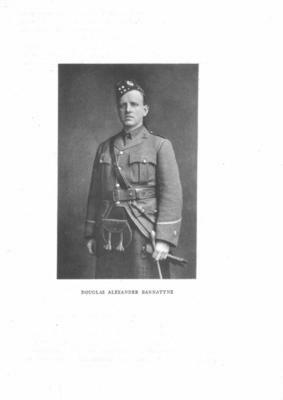 He served in the 1st/9th Battalion Royal Scots, serving on the Western Front in France. He was killed in action on 1 August 1918, in the French department of Aisne, during an Allied advance on the town of Fere-en-Tardenois. Lieutenant Bannatyne is buried at the Raperie British Cemetery in Villmontoire and has a memorial at the Glasgow Necropolis, erected by his family.